As the much-missed Grandaddy observed on their final album, "Summer, it's gone and I don't know." Sunny hols now behind us and French BN biscuits are all eaten. Refreshed, let's regroup, refocus and review an eatery. On y va and all that. A year ago we resumed our Friday thing with a Felixstowe foray to the Italian-style Cafe Bencotto. 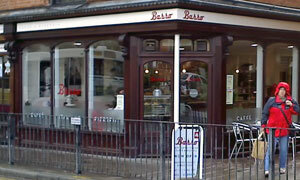 A year later we're taking an Ipswich outing to the Italian-style Caffe Basso. I'd directed jobseeker Grenvyle to meet us on Tacket Street, along from Millets. Perhaps I should have foreseen that he'd head for the other camping shop branch on Tavern Street, though it's really on Carr Street. He found us eventually. Weirdly, Kelly's 1970 directory tells us that 18 Tacket Street was home to Granville Town & County Florist. Got good vibes from the moment we stepped in here, having been greeted in a friendly fashion and talked through the available food. Who cares if the options are limited when the pizza squares are freshly made and can be accompanied by a balsamically dressed side salad? Drinks wise, we're sipping our San Pellegrino aranciata. Sadly for me, and possibly me alone, they no longer serve the acquired taste that is Chinotto. A big draw must be the free WiFi, and I saw a newspaper or two, plus assorted free local listings mags, always a good indicator. Enough: let's talk about the coffee. That Illy logo announces "quality", and there's a fantastic looking coffee machine on display. My double macchiato was among the best I've had. Ever. Darn good on its own. Even better with an Italian slice of torta di Americano, i.e. cheesecake. Final point: I had to go into town the next day, and I went to Caffe Basso again for another macchiato. Quite possibly my new favourite cafe. If it was a car -- Lamborghini Gallardo. If they were passing by -- Antonio Carluccio. < Have I Got Languedoc?